ISRN-UHAMKA has been using five different sensors to detect the presence of dawn, although we have concluded that the SQM is actually our main instrument. As you will see from the following video presentations, SQM is a very versatile instrument for such tasks. 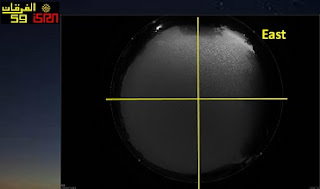 In this second video, ISRN-UHAMKA is presenting a verification process of the presence of dawn detected by the SQM data using an All Sky Camera (ASC). ASC is a reliable instrument for many environmentalists. It is basically an ordinary DSLR camera equipped with a fisheye lens capable of capturing half of the hemisphere. An Open Fajr Project initiated by Muslims in Birmingham, UK has used an ASC as the main (and the sole) sensor to rectify the commencement of the Fajr prayer. A Consensus Panel consisting of 19 experts was formed to analyze hundreds of ASC imageries manually (i.e. visually). They conclude that the new dip for Birmingham is -13.4 degrees. It is unclear whether or not this new dip is then adopted by all Muslims in the UK.